Never pay for primary research. You should never pay to read or to publish primary research. Scholarly publishing is in a bind. In trying to move a business model from being subscription based ‘back loaded'(paying to read primary research) to Open Access ‘front loaded’ (paying to publish primary research) issues of integrity and ethics have come to the fore. Even though less than a third of the journals in the Directory Of Open Access Journals have any fee for publishing , Open Access front loaded journals have been occasionally given a reputation for being pay to publish, vanity or even downright fraudulent. Open Access is all about making primary research free to read. It recognizes that the research has been paid for, in the main, taxpayers, and so should be available to them. Various international conventions, statements and manifestos (all in places that begin with ‘B’) comment on the essential rightness of everyone having equal opportunity access to knowledge. Its a prima facie Good Idea. The problem comes when trying to decide how you are going to pay to provide access to the knowledge. In the old days knowledge was scarce, and paying editors and reviewers to carefully package it up into neat, well described bundles was the done thing. Libraries paid subscriptions to the journals, and then disseminated the information as widely as they could. These days we could argue that we have gone from scarcity to a proliferation, a flood, an abundance of knowledge, and the problem is no longer making tidy parcels of preciousness, but trying to get what you need in a firehose of articles and data, fired right in your face. I’d like to suggest that we can use the same solution as the old days – editors, reviewers and journals, and that subscriptions are the way forward. Not only do I think that paying for access to primary research is inequitable and wrong, I don’t think you should pay to publish it either. Its simply creates too many issues that can be exploited for the benefit of profiteers, or incentives to bad behaviour. So, where does the money come from? And how do we deal with the problem of an economy of abundance? Here’s my suggestion. All primary research should be made available in repositories, journals and archives that are funded by those that encouraged the research in the first place. Money for research comes from a lot of different places – institutions, governments, endowments and businesses. The result of the research is part of the research process, and publication shouldn’t be seen as separate. The mechanisms for doing this already exist. 2/3rd of Open Access journals fund themselves from something other than front or back loading payments – they can be hosted by Universities , by scholarly societies, directly by funders , held in disciplinary  or institutional repositories , or just paid out of the pocket of individuals. This mode – free to read, free to publish is already normal. This ease and low cost of entry however, helps create the problems that come with abundance. I set up six journals in the last 18 months, and they are all still going. Consider the number of articles that get submitted to Arxive, currently nigh on 10,000 articles a month . Instead of trying to force institutions to pay subscriptions to primary research, or arbitrarily change to ethically questionable front-loading, lets put that money to work in quality assurance, and service. 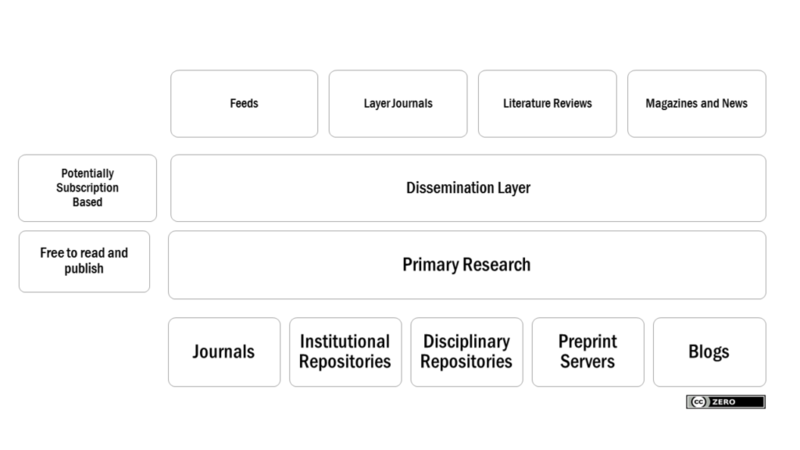 I’m suggesting a radically improved research dissemination industry, where the torrent of new primary research is digested, sorted, described and judged. Current commercial publishers could pivot to providing services – subscription services that help to filter out the subjective wheat from the chaff. I already use feeds  to manage this at a basic level, but the range of services go from research description and journalism (New Scientist) through to specialist clipping services on the most obscure of fields. Imagine if the 26 Billion dollars currently spent on recovering access to research already paid for, went into editorial, reviewing and republishing. I’m not suggesting that peer review should always happen after work has been made available. Its possible this could happen for some disciplines, and the current real practice with a lot of work going through arxive is exactly that. Again, that figure from DOAJ shows that 2/3rds of the journals can provide some level of quality control finding funding from things other than author payments. The dissemination level, though, can assess work in more than just one way – it can concentrate on multidisciplinary intersections, or just novel or negative results. How much would you pay for a professional literature review in you field once a month? Or a stream of research about (say) pandas, from any perspective. This creates a whole new set of business opportunities, but only if the primary research is licensed to it can be exploited in this way. It becomes imperative for the work’s impact to have an ‘open culture’ cc-by or cc-zero licence: much like the ones already in use by PLOS and other mega journals. Here is a program to follow to get to this state of all primary research being truly free. First – stop paying for hybrid. Hybrid journals where some content is made open through author payments is just broken and wrong. Stop it now. Secondly, mandate all your institution’s work, or work funded by your organisation to be made available, immediately in a repository, with a licence that enables reuse. cc-zero, or at worse cc-by. Thirdly, legislate that researchers in your country cannot give away their copyright to publishers for nothing and for ever. The moral right always resides with the authors, and the legal copyright lives with everybody. Fourthly, start an business that collates interesting research, and get subscriptions for it. Of course everyone could read it for free, but their attention is precious, and they’ll pay to make sure they don’t miss anything. If you think that’s unrealistic, as someone who has used a Bloomberg terminal! Prev Why is Open Access floundering? Libraries have not let piracy do its job.